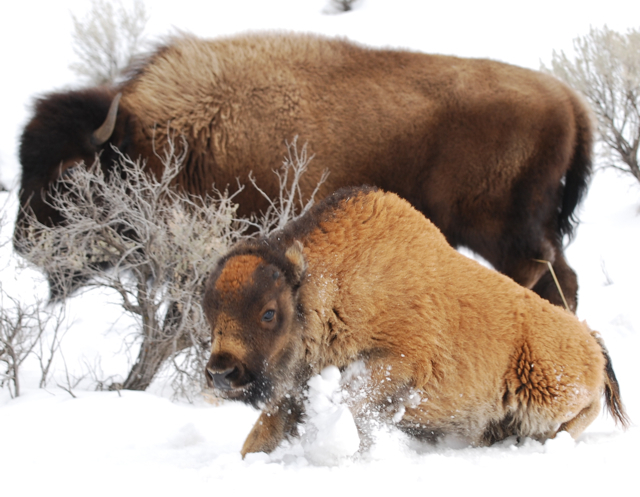 Late bison calf in Yellowstone leaping through deep snow (Photo by Beth Pratt)At the north entrance of Yellowstone National Park, a small late-born bison calf wanders with his herd, defying all odds in surviving the winter. The calf, nicknamed “Zisa” (the Lakota word for orange), can be seen around the Mammoth Hot Springs and Gardiner areas, its bright reddish-orange coat standing out against the snowy terrain. This past weekend the intrepid calf and his family wandered the area surrounding the Mammoth Hot Springs campground in search of forage, then headed south down the park road in the direction of Gardiner, causing traffic to stop due to the ensuing ‘bison jam.’ Delighted park visitors observed little Zisa as he leapt through the deep snow and followed his mother down the highway. 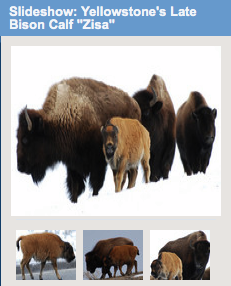 Once Zisa’s coat turns to brown, he’ll be difficult to spot, but park staff and visitors are rooting for him to survive the winter.